Recently a group of students and two staff took our new bus to East Side Painball. They had a great time and several of them looked surprisingly unpainted on their return. In School Meeting last week one of the paintball participants suggested another trip, although the fee is probably too steep for enthusiasts to go very often. 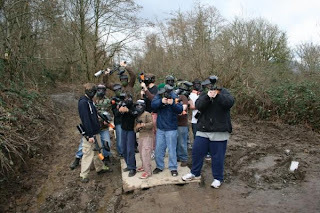 Shane, one of the paintballers, took this picture before they all got started. Thanks, Shane!